PAUL JAY, SENIOR EDITOR, TRNN: Welcome back to The Real News Network. I’m Paul Jay, coming again from Beirut. And joining us again is Professor Fawwaz Traboulsi. He’s an associate professor of political science and history at the Lebanese American University and at the American University in Beirut. And his recent book is A History of Modern Lebanon. Thanks for joining us again. FAWWAZ TRABOULSI, PROFESSOR OF POLITICAL SCIENCE AND HISTORY, LAU: My pleasure. JAY: So we get into about 1980 and the Syrians are now controlling Beirut and the north of Lebanon; in the south the PLO is operating. And maybe you could describe a little bit of what’s happening with the PLO forces and then what happens in 1980. TRABOULSI: Well, the weaker partner now has become the Lebanese National Movement, because 1977 the leader of that movement, Kamal Jumblatt, leader of the Socialist Party and of the Druze community, is assassinated. There is a coexistence between the Syrian army and the Palestinian. JAY: And do we know who assassinated him now? JAY: And to remind everyone, the Phalangist Party is a far right wing militia. JAY: Mainly Christian. Now, just describe what’s happening in the warfare between the PLO and Israel. Like, at what level is the fight? TRABOULSI: Well, here an important development occurs, which is an Israeli invasion of 1978. JAY: And why did they invade then? TRABOULSI: The idea was to secure some 30 kilometers free of PLO existence, which means that the PLO will not be able to carry on military operations, not even [inaudible] rockets or artillery bombs. But what is more important is that ’78 is the creation of the Army of South Lebanon, a section of the Lebanese army now allied to Israel. And from ’78 onwards, 10 percent of the Lebanese territory now is under Israeli practical occupation through this surrogate army, but with the presence of Israeli troops. A chunk of Lebanese territory is now under direct Israeli occupation. JAY: And much of the way this period isï¿½the history is written, there’s a point where PLO fighters go into Israel and take some buses and kill some people on buses. When is this, and what effect does this have? TRABOULSI: Well, there’s always been military operations, and at times operations that touch upon civilians. This starts from ’68 untilï¿½mainly until ’78, where there is this border strip now, which fences off Israeli borders from the direct incursions. So there’s more recourse either to incursions through the sea or to artillery hits against northern Israeli kibbutzim and settlement. JAY: Was there some debate within the PLO at the time about this tactic of whether you hit civilians versus Israeli soldiers? TRABOULSI: There was a debate, actually. There’s always been debates, from the time where you had operations against airplanes, the kidnapping of airplanes, and at that time there are discussions on it. Actually, most of the operations from ’78 onwards are no more direct incursions into kibbutzim; they are artillery bombardmentï¿½of course, bombarding kibbutzim, which, ultimately, it mean civilians. But I should remind the viewers that from ’68 onwards, the number of civilian Lebanese and Palestinians who were killed by Israeli planes, or booby traps, or artillery was invariably higher than the fewï¿½technically, the few Israelis who were killed by Palestinian operations. You’re talking about thousands here and, you know, a few dozens at best there. JAY: Which continues today with what happened in Gaza. So talk about what happens next. TRABOULSI: With the failure of controlling [snip] the borders, this strip, is incapable of controlling the borders, you enter into a totally new strategy, in which first the rise of one young leader in the Phalangist Party, named Bashir Gemayel, now takes over the whole Christian area, liquidates all the other militias, builds his own militia, and is grooming himself for the presidency. And 1980, the United States invites him in a secret visit to Washington, where he is told, you will be the next president of Lebanon. So 1980 there’s an Israeli-American plan to invade Lebanon, and the idea this time is to push at least the PLO to Beirut, if not farther than thatï¿½as the term was used, to destroy the infrastructure of the PLO, which means much more than the military infrastructure. So 1980 to 1982, the United States and Israel are preparing for what will become the war of June 1982. As some know, at first that was represented as a limited military operation by Defense Minister Ariel Sharon to Prime Minister Begin, which will take two weeks and will just reach Sidon. Then, with the help of Mr. [Alexander] Haig, the Israeli plan stretches to reach Beirut and besiege Beirut. So you have a military operation of two stages, but which ends with the victory not only of the Phalangist Party but with the leader, this young leader of the Phalangist Party, becoming the president of Lebanon, elected president of Lebanon, and a Parliament which is besieged by Israeli troops. So this is the time where we should bear in mind that by that time Camp David agreement has been created, there is peace between Israel and Egypt, and from 1979 onwards the Israeli establishment is looking for what they called the second Arab country to sign a peace agreement, and the idea is that not only would Lebanon sign a peace agreement, but we will have our president in Lebanon. Now, it so happened that just a few days before taking over his post as president-elect, Bachir Gemayel is assassinated, upon which the Israeli army decides to invade Beirut, which they do. 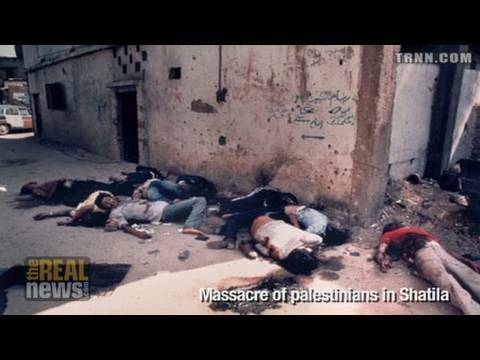 And it’s during that period that the massacres of Sabra and Shatila Palestinian camps occurred, under Israeli control and encouragement, duplicity, but with the executive power of the military arm of the Phalangist Party (called the Lebanese Forces now), and a part of the fighters of the South Lebanese Army. JAY: And if I understand correctly, thousands of mostly civilians in the camps are killed by the Phalangists. TRABOULSI: At least 1,000-plus of mainly Palestinians, but also Lebanese, because there are Lebanese living in the camp, almost all civilians, killed in that. That created a huge international outcry for a number of reasons, to start with, because the United States administration has pledged to the Palestinian leadershipï¿½which was forcibly kicked out of Beirut by the Israeli siegeï¿½that the Palestinian civilians would be safeguarded. And we had an international mission of troops which were suddenly withdrawn from Lebanon and theï¿½especially they were guarding the camps. So there is American, Italian, British duplicity in the fact that the camps were not guarded. JAY: So if I understand correctly, the Israeli troops had made it to Beirut, they had the PLO leadership more or less under siege, there’s a deal for the leadership to leave, and then the camps are essentially left unguarded and the Phalangists attack. The Phalangists attack, but the Phalangists were brought to the vicinity of the camps by Israeli troops, because it was impossible for them to go directly through the Muslim. So they were taken through the Lebanese airport to Beirut airport and into the camps. So that we know, actuallyï¿½the Kahan Commission did incriminate Defense Minister Sharon. JAY: And who had to actually step down as defense minister. TRABOULSI: For indirect responsibility for the massacre. JAY: Well, in the next segment of our interview, let’s continue the modern history of Lebanon. Please join us for the next segment of our interview with Fawwaz Traboulsi.